So just what is slow economic growth then? Just how difficult this has become was shown last week when the OECD released its predictions for the world economy until 2060. These are that growth will slow to around two-thirds its current rate; that inequality will increase massively; and that there is a big risk that climate change will make things worse. Despite all this, says the OECD, the world will be four times richer, more productive, more globalised and more highly educated. If you are struggling to rationalise the two halves of that prediction then don't worry – so are some of the best-qualified economists on earth. World growth will slow to 2.7%, says the Paris-based thinktank, because the catch-up effects boosting growth in the developing world – population growth, education, urbanisation – will peter out. Even before that happens, near-stagnation in advanced economies means a long-term global average over the next 50 years of just 3% growth, which is low. The growth of high-skilled jobs and the automation of medium-skilled jobs means, on the central projection, that inequality will rise by 30%. Not the predictions themselves, which come from this OECD report, but the interpretation that is put upon them. For it appears that Paul Mason, supposedly one of those employed to explain the world to us, is incapable of actually reading a report. On the inequality point he's missed the crucial qualifier: "in-country" inequality. The report is actually telling us that the currently poor countries are going to catch up with the currently rich ones and that when they do, when they join us at the technological frontier, then their growth will be lower than it is during the current catch up phase. That is, the prediction is that the vast gulfs of inequality between those living on a $1 a day and ourselves will be closed: yet Mason is concerning himself with that trivial 30% rise in inequality amongst ourselves, the already rich. It's absurd to be worrying that in-country gini will rise from, say, 0.30 to 0.39 while not celebrating the collapse of the global gini from 0.80 to 0.40 (made up numbers just for illustration). At least it's absurd if inequality is one of those things that you want to worry about. There's another misunderstanding there, one which anyone who has actually read Piketty should understand for he explains it very well. Gross GDP growth, the size of the entire economy, is driven by two different things. One is the expansion of the population that is producing that GDP. The other is the efficiency with which each person is contributing to that GDP. The report is stating that the entire globe is just about to finish going through the demographic transition, as the UN and everyone else assumes it is. 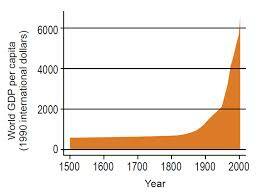 Thus population growth will not be contributing to growth after some few decades of the future. 3% (or 2.7%) growth without the demographic effect is not low or slow growth: this is fast growth. The economy doubles every 25 years or so but over the same number of people meaning that per capita GDP doubles every 25 years. This is not an historically slow level of per capita GDP growth. This is actually rather fast. It's not the specific predictions that worry at all: it's that someone supposedly employed to explain such matters to us doesn't seem to understand the points being made. How did we end up in this situation? One of the upsides of having a global elite is that at least they know what's going on. We, the deluded masses, may have to wait for decades to find out who the paedophiles in high places are; and which banks are criminal, or bust. But the elite are supposed to know in real time – and on that basis to make accurate predictions. Newer PostMy word, you mean competition actually works?